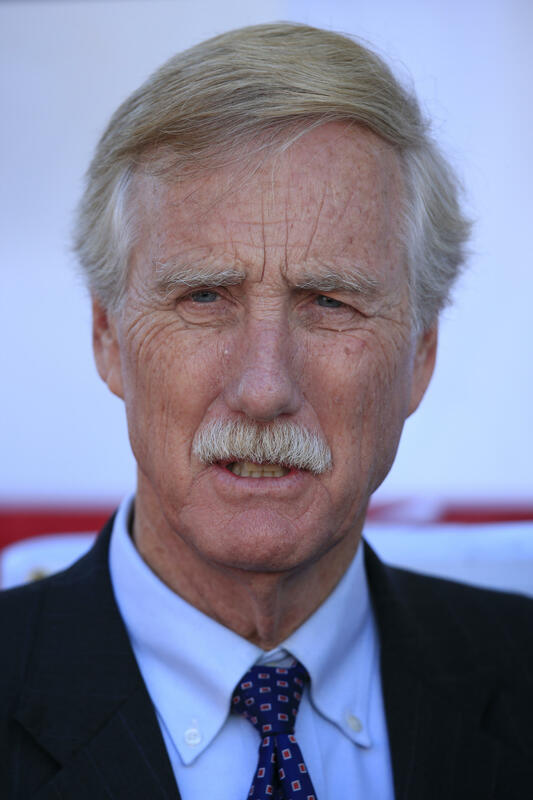 FILE: Sen. Angus King I-Maine, attends the christening ceremony for the USS Raphael Peralta, the 35th Arleigh Burke Class Missile Destroyer to be built by Bath Iron Works, Saturday, Oct. 31, 2015, in Bath, Maine. He says a big surge of U.S. combat troops has been tried and didn’t work and the President telling Pakistan they can no longer harbor terrorist groups may be the most significant part of his speech. King hopes Trump’s plan of focusing on getting other nations involved, both with military action and providing economic aid, will stabilize the country. “The importance in the long run may be the notice that he served on Pakistan that they can’t continue to be just a sort of ally, accept our military and other aid, and yet at the same time provide cover and sanctuary for terrorist groups,” he says.